With pocket HD camcorders multiplying by the dozens (most with 1080p functionality), we were starting to think Flip, er Cisco had fallen asleep at the wheel (or the Slide! ), but the category pioneer has finally gone and updated its core Flip MinoHD and UltraHD lines with some much-needed features. Starting on the lower end, the 4GB Flip UltraHD is now just $149 --it'll capture one hour of 720p video at 30fps. That's a great price, but it's certainly the least interesting of the bunch -- the more notable additions are baked into the $199.99 8GB UltraHD, which is 20 percent slimmer with a new rubber casing and finally (finally!) gained image stabilization. Flip's still not playing the raw specs game, though -- the 8GB Ultra shoots 720p/60 video, which Cisco says maximizes video quality while keeping file sizes easier to share. Sure -- we don't think a 1080p/30 mode would have overly complicated things, but Flip's all about one-button simplicity, after all. The 8GB Ultra also sports a new FlipPort expansion port, which is the centerpiece of the "Designed for Flip" accessory program. All kinds of things can plug into the FlipPort; highlights of the launch lineup include a Scoshe wireless microphone, an iGo pico projector, and a SeaGate portable hard drive / storage extender. Cisco tells us the FlipPort will hit the other Flip models over time, and that it's expecting tons of Designed for Flip accessories -- beyond those for the new FlipPort, there will be a Bower magnetic wide angle lens and loads of new cases. It's an interesting sort of complexity to offer on a camera otherwise almost aggressive in its simplicity. 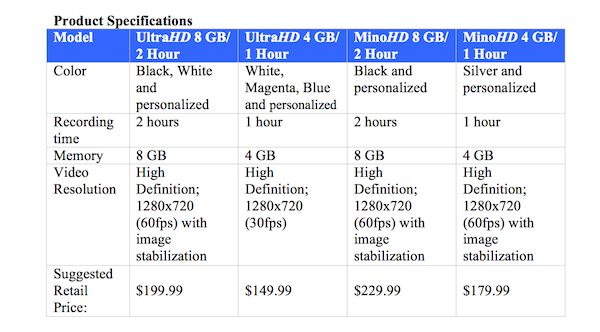 The MinoHD line also nabs the new image stabilizer and 720p/60 video mode -- the new silver 4GB MinoHD will retail for $179.99, while the matte black 8GB MinoHD will run $229.99. All the new models can be ordered on Flip's website today, and if personalization if your thing, each can be customized with different designs or an uploaded picture of your own. We can't say there's a lack of new stuff, and while we're still a bit confused by the absence of 1080p recording and a still shot mode, there's something to be said for the company's studious focus on simplicity. Whether 720p/60 video can hold up to the competition's 1080p is still a giant question mark, but we just got our review models and we'll let you know how things go later this week. Until then, enjoy some of the beauty shots below as well as the full press release after the break. SAN FRANCISCO, Calif. – September 20, 2010 – Cisco's Flip Video®, the world's leader in shoot-and share video cameras, today rolled out an all-new line of affordable UltraHD™ and MinoHD™ video cameras. These new video cameras feature Flip Video simplicity, enhanced HD video quality, hardware-based image stabilization, expanded product personalization options, and more ways to share video using pre-loaded FlipShare™ software. Flip also announced today Designed for Flip™, a new program offering fun accessories from a wide range of partners that include everything from wide angle lenses and external microphones to battery chargers and a portable projector (see separate release). "This is without question the best line of Flip Video cameras we've ever created," said Jonathan Kaplan, senior vice president and general manager of Cisco Consumer Products. "The new line combines Flip simplicity, affordability and fun with truly breakthrough video quality, image stabilization, and unlimited personalization options." Building upon the acclaimed Flip Video user experience -- which makes it easy and fun for anyone to capture and share video -- Flip Video's new line has raised the bar again, by delivering amazing video quality without compromising Flip's hallmark simplicity. By combining its innovative, always-on image stabilization technology with 720p resolution at 60 frames per second (fps), Flip now offers the consumer stunningly clear and steady video that's both simple and affordable. The new Flip Video line is available nationwide starting at just $149.99, offering a video camera for every budget. In addition, the entire Flip Video family is now available in personalized designs so Flip owners can express their own personal style with every Flip they buy, at no additional cost. Consumers can visit the Flip Online Store (TheFlip.com) to choose from thousands of designs from artists, celebrities, and iconic brands, or upload an image to create their own one-of-a-kind Flip video camera. The new Flip video cameras also come pre-loaded with the latest version of FlipShare, which helps consumers easily organize, edit and share their videos. FlipShare upgrade now includes direct posts to Twitter™ – joining the convenient direct-share options already popular with Facebook™ and YouTube™. Flip Video users can count on stunning video no matter how they choose to view or share it – on a computer, their HDTV or using the simple direct uploads to social media sites. The world's best-selling shoot-and-share video family – the Flip Video UltraHD – now offers two new models with even more reasons to own one. For the first time, the UltraHD line offers personalization through the Flip Online Store (TheFlip.com) with thousands of designs for users to create a video camera showcasing their own personal style. Along with always-on image stabilization and newly enhanced 720p/60 fps video quality, the new Flip Video UltraHD 2 hour also features a new slimmer design that fits easily in a pocket or purse. The UltraHD 2 hour is the first Flip video camera to feature FlipPort™ – a proprietary Flip-designed connector enabling new add-ons options as part of the newly announced Designed for Flip™ accessory program. The new Flip Video UltraHD 1 hour is the first-ever HD Flip Video camera priced at $149.99. An industry top-seller and consumer favorite, this Flip offers more for less: one hour of high-quality HD video; Flip simplicity, no-hassle built-in memory; plus a choice of magenta, blue, white or thousands of unique designs. The new MinoHD 1 hour and 2 hour video cameras are sleek and stylish with enhanced HD video quality. Like the new UltraHD 2HR, the new MinoHD video cameras now feature the built-in image stabilization and 720p/60 fps combination allowing consumers to capture incredibly clear and steady video. Flip customers can opt for black, silver or from thousands of designs at the Flip Online Store (TheFlip.com). To express their own personal style, consumers can easily upload their own image to create a one-of-a-kind Flip MinoHD video camera. The new Flip video cameras will be broadly distributed and are available starting today at the Flip Video Store (www.TheFlip.com), Best Buy and Amazon.com and coming soon to Wal-Mart, Target and Staples.